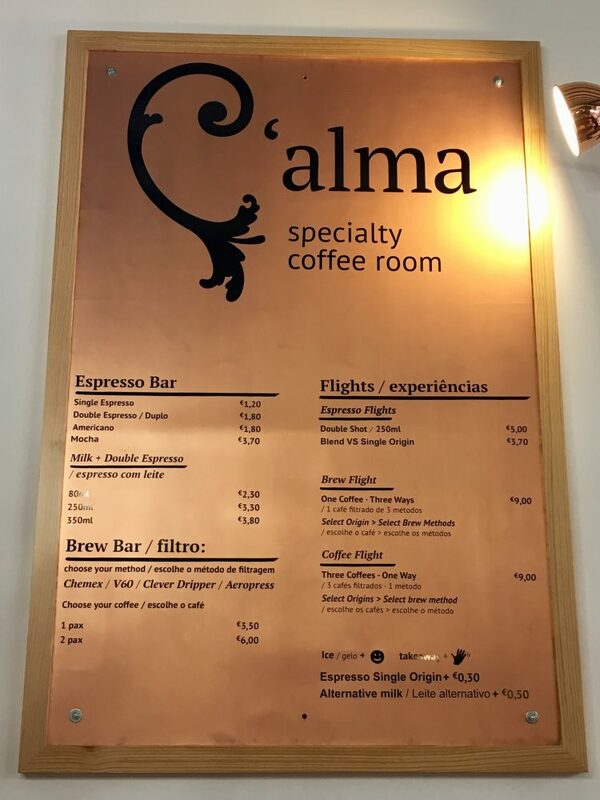 C’alma Specialty Coffee Room – Porto, Portugal. We love this place. I found a fabulous coffee shop in Porto last week called C’alma. We’re still in Porto for the next couple of weeks. It’s a lovely place (read why it’s a great place to visit or live here). We walk the streets regularly, and they’re filled with cafes and coffee shops beckoning me with aromas, cute chairs outside under umbrellas, and seeing everyone enjoying their espresso with each one we pass. But not all cafes are great for digital nomads. 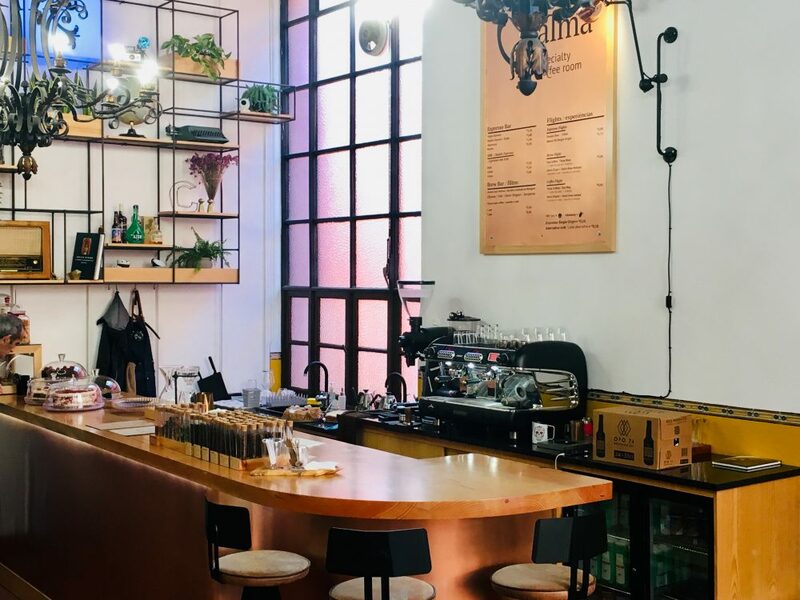 Personally, I like a cafe with quality coffee, ample space to work, isn’t too crowded or noisy, has an easily accessible (and preferably clean) bathroom. I like a friendly staff and I love supporting the local businesses. Of course, we enjoy wifi, too. Though, I admit wifi isn’t a deal-breaker for us. We’re prepared with podcasts, audio books, and pen to paper writing and brainstorming when wifi isn’t available. I also like when a coffee shop makes it easy to drink water. Like, no hassle. Surprisingly, it’s not so easy in many cafes in Porto. They want you to buy bottled water. That’s too bad because the waste of plastic and money, especially when the tap water is perfectly delicious and safe to drink. We found that perfect cafe in Porto… C’alma. We have been many times since our first visit. Each time lovely like the last. C’alma – Specialty Coffee Room. Indeed. Digital nomads can easily work at C’alma. Cafe Americano presented here. This coffee shop ticks a lot of boxes for me, namely all those I just listed. As for the meaning of the name… it’s a combination or “calm” … or slowing down… i.e., slow coffee… and more specifically… “with soul.” So all of those things together. Damn that’s good. The decor of C’alma is such that they paid great attention to detail. Seems like a comfortable combination of old-world and modern. They serve their coffee, by default, in glassware, because they simply expect everyone is there to drink their coffee. This encourages you to take a break, sit down, and enjoy your java. If you want it to go, you better specify. A minor but notable experience: I appreciate that they ring me up at the end of my visit. I just like that… having a tab open at a coffee shop. It’s less transactional, and I feel welcome to stay as long as I want. 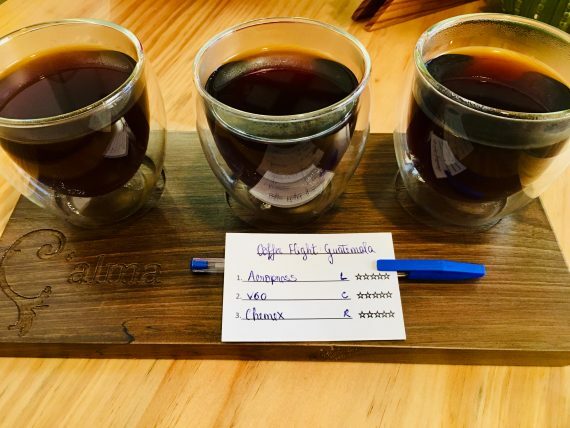 That means you can get a flight of coffees brewed in the different methods to try at C’alma. For the picture above I chose a coffee flight for a Guatemalan bean. 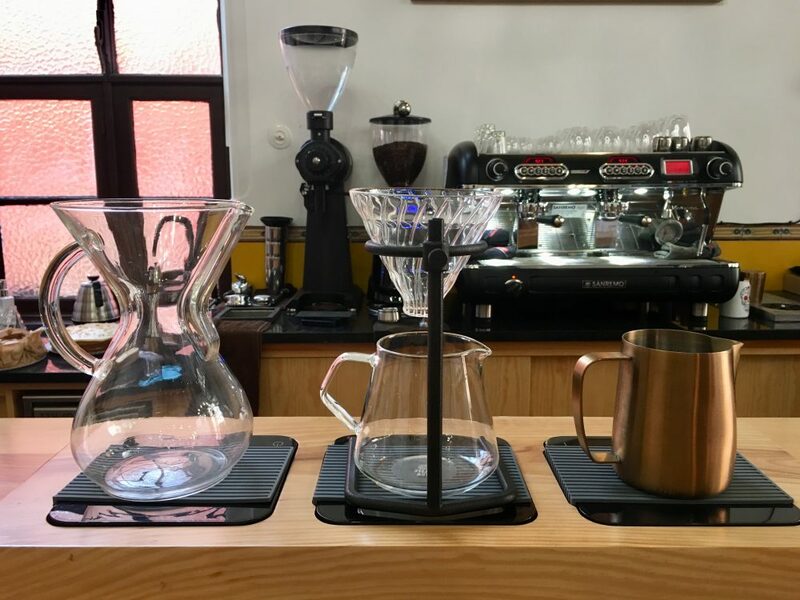 I opted for the Aeropress, v60, and Chemex brewing methods. They served a glass of sparkling water to cleanse my palette between tastings. Apart from getting jazzed on all the caffeine, I was blown away at the differences when trying them side by side. 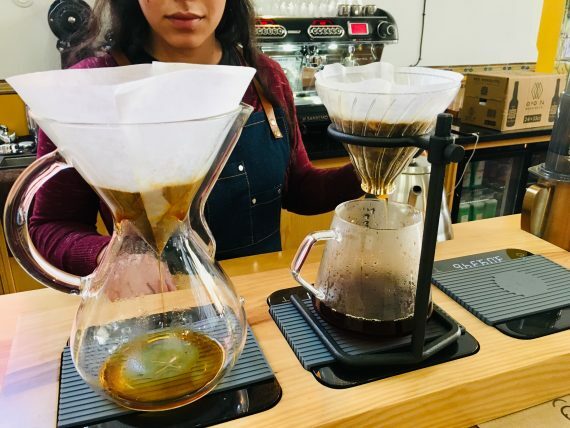 I liked the Chemex best which I find interesting because I’ve never had coffee brewed with the Chemex. Or you can get a flight of different coffee beans brewed in the same way. For example, maybe 3 different regions of the world all experienced via the Chemex. 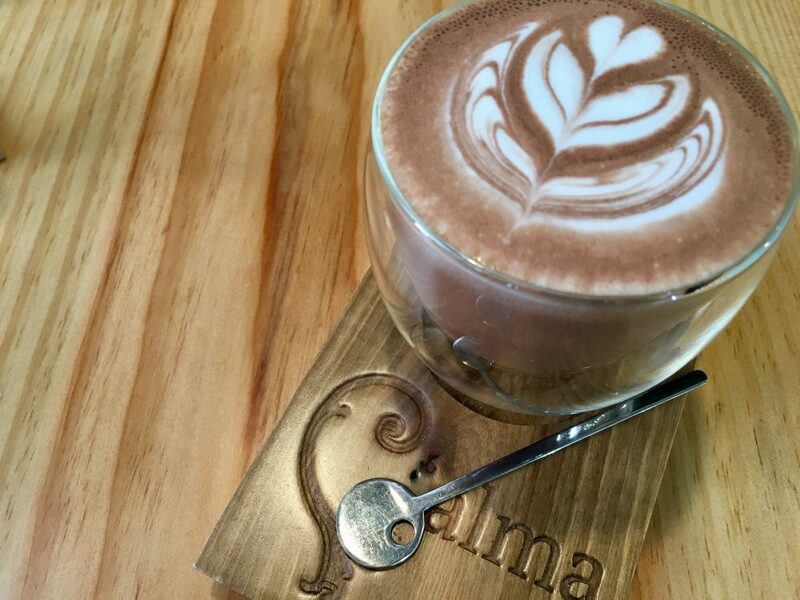 They serve only a few choices of locally made cakes at C’alma on any given day. You might arrive to see two gorgeous cakes or three on other days. They usually change what cakes are offered every 1 to 2 days, too. We ate a slice of chocolate one day (and loved it). Another time, again, a chocolate cake but made differently. Most recently, we tried a cake made with both guava and Parmesan cheese. 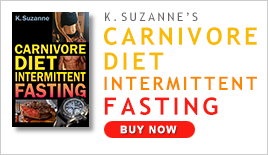 The simplicity of choices – the minimalist approach – it speaks to me. And, it keeps me coming back. When we’re presented with food as art, we enjoy it at a higher level. Food and drink become a deeper experience, and a longer-lasting memory. 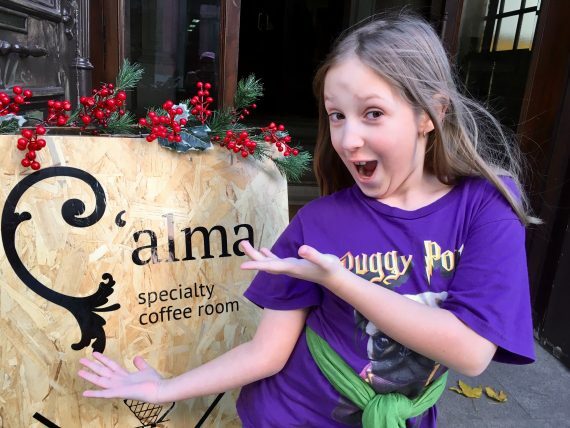 C’alma goes above and beyond. They don’t stop the presentation of serving in just glassware. They take their coffee art next level. 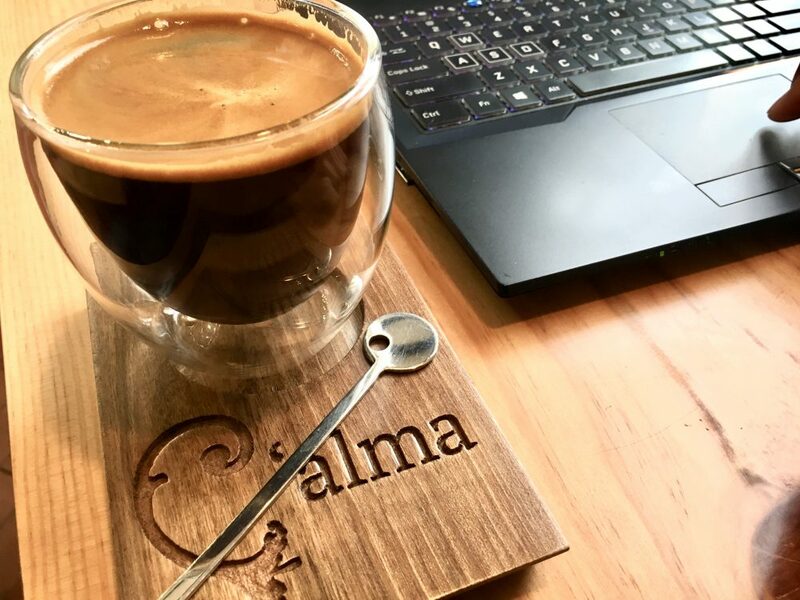 They serve their pretty coffees and drinks on these lovely wooden tray-blocks – and with special spoons to boot! Again, it’s this attention to detail (much like our experience at MUU) that makes me a loyal customer. C’alma’s hot chocolate is the only one my daughter likes. It’s only sweetened in the slightest and she loves it. 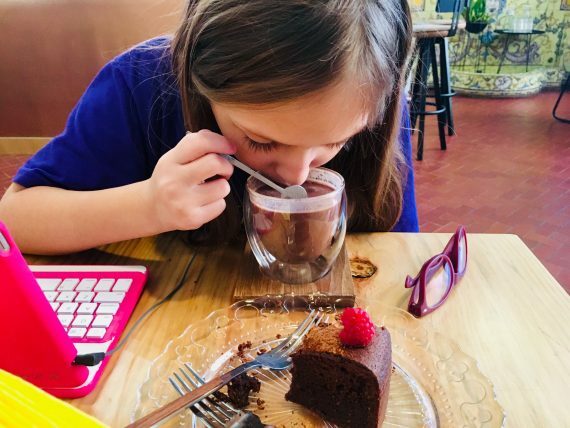 She’s tried many hot chocolates in her years, and she’s never finished one… ’til now that is. C’alma’s hot chocolate is different. She eagerly drinks it. Sometimes she orders two. 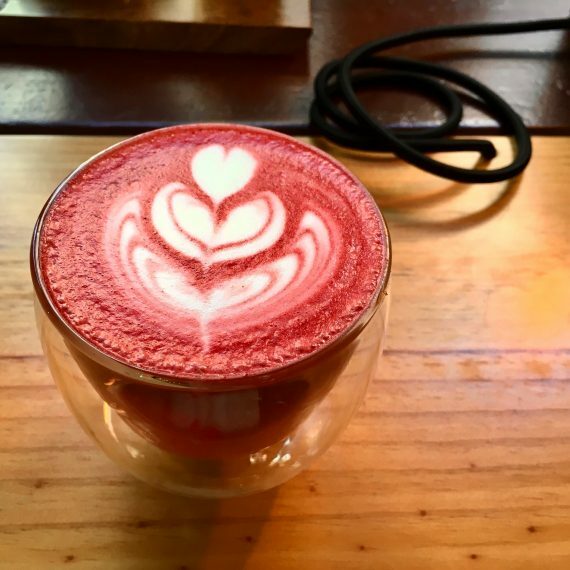 They recently introduced a groovy beetroot hot milky drink. They mix together a beetroot powder (which includes ginger and other spices) with steamed, frothy milk. 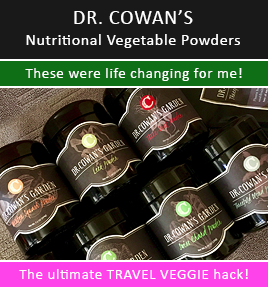 For those who like vegetables and want to avoid caffeine, this could be your jam. I couldn’t resist. It was just too pretty. They also serve a few fabulous teas, including a loose white tea which I rarely see in coffee shops. Again, true to form, there are only a few selections, but they’re good and proper offerings. 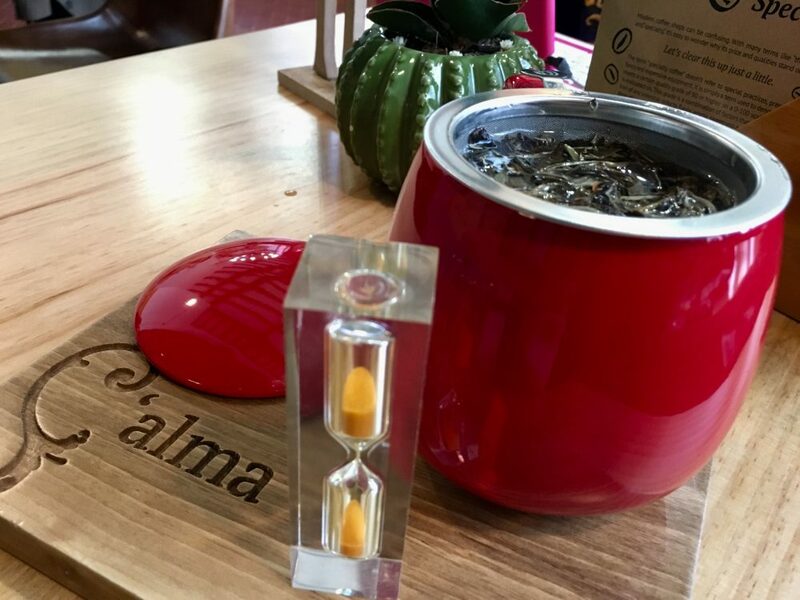 The tea comes served in a bright red mug, perfect for wrapping chilled hands around, plus a timer to let you know when to take out the leaves. No tea bags found here! 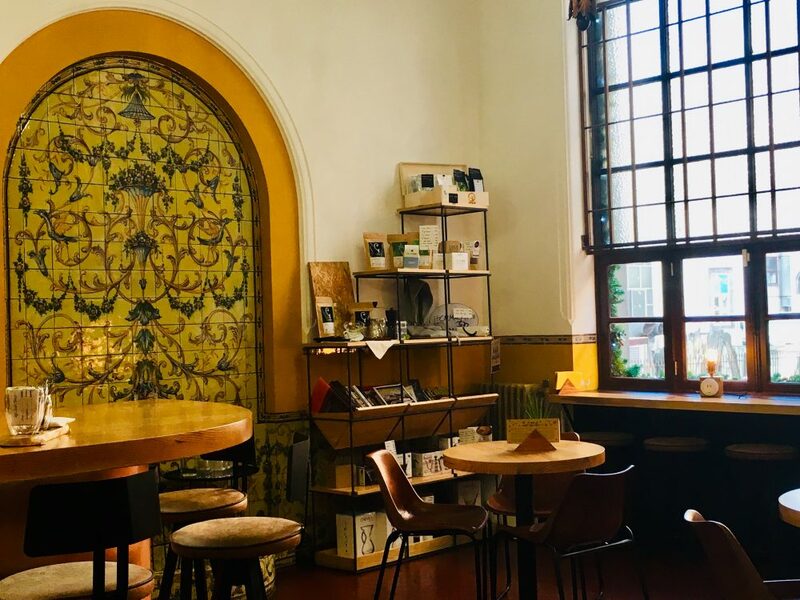 If you’re visiting Porto, I highly recommend enjoying C’alma for a coffee experience you won’t forget. You’ll be happy you did. They’re closed Sundays and Mondays sadly. Also know that they close in the evening during the week at 7pm (8pm on Friday and Saturday).